From the Spring 2014 Collection: "Excellent color combo! This is such a beautiful Spring print on a classic Paul Andrew silhouette." Just as a cat-eye creates drama when it comes to makeup, Paul Andrew goes for the same effect on this striking winged sandal. 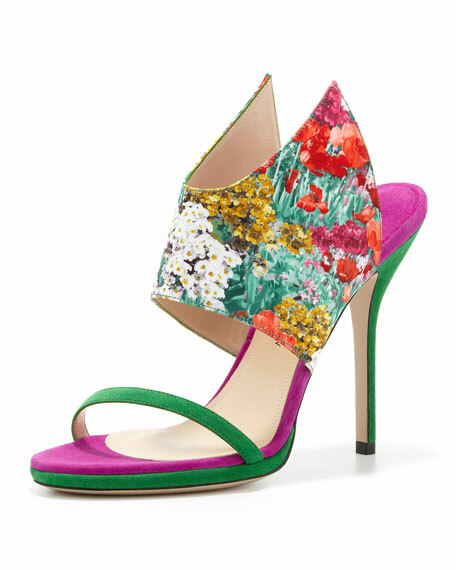 A vibrant floral print and garden-ready shades speak to Spring 2014 style. Suede with floral-print-silk winged upper. Thin, angled strap bands vamp.